Trace of a Nexus 8 recently popped up when a mysterious "flounder" device was spotted in some Google code. Now tech website Myce has had another sighting of the fishy tablet, believed to be the Nexus 8. One of the spotted entries confirms that the device will be Tegra-based, with mention of both a 32-bit and a 64-bit CPU. But right now it's expected that Google will hit 64 in order to take on the iPad Mini, which packs Apple's A7 64-bit chip. With Google I/O taking place on June 25 and 26, it would be the perfect time to get the Nexus 8 out the door. But chances of a new Nexus phone may have been dashed earlier this month, as it was claimed that Google had pulled the plug on its line of handsets in order to focus on the rumoured Android Silver. 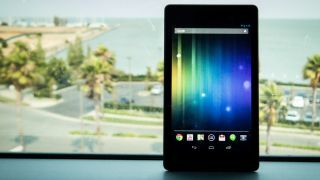 Supercharged with Android 4.4, how good is the Nexus 7?